SACKED News of the World staff had the last laugh over News International chief Rebekah Brooks yesterday — by burying a host of insults allegedly directed at her in the newspaper’s crossword. The page 47 puzzle was loaded with less-than subtle digs at the former editor over her decision to cling to her job. The clues and answers hinted the furious axed staff a were having a dig at her. The clue for nine across, “Brook”, highlighted the person the cryptic crossword was aimed at. Other clues revealed the true feelings of the staff, including “Woman stares wildly at calamity”, “Will fear new security measure” and “Mix in prison”. 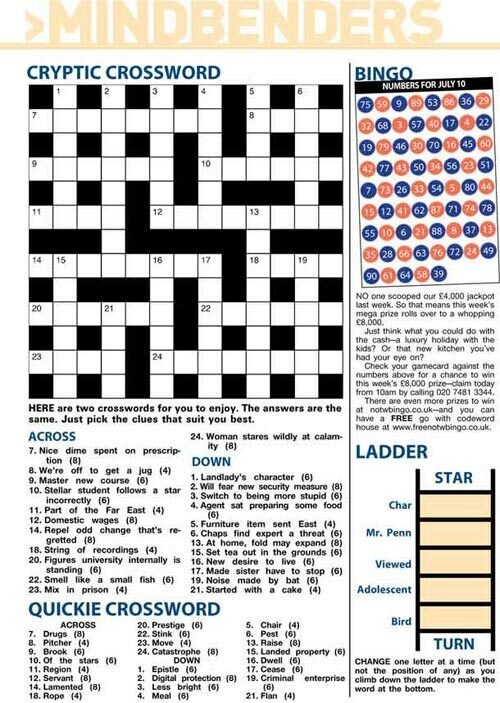 While 10 across, “stellar student follows a star incorrectly”, could have referred to Mrs Brooks’ rise through Rupert Murdoch’s company. The crossword suggested the paper’s closure will not be the end of the matter, as the 13 down clue said “At home, fold may expand”, while the 19 down hint was “Criminal enterprise”. The answers, at the bottom of page, included “Deplored”, “Tart”, “Stench” and “Disaster”. Others were cryptic, including the answer to four down, “Repast”, meaning the meal which comes after a funeral. This suggested whoever signed off the crossword thought Mrs Brooks deserved her just desserts. But, however angry the News of the World staff were at Mrs Brooks, they would not let her stop them hitting the pub. The clue to eight down was “We’re off to get a jug”.